Bulago Island is an equatorial, tropical island strategically located on the Lake Victoria, only 10 miles east of Entebbe International airport and 18 miles south of Munyonyo, a lakeside perturbation of Kampala, Uganda’s capital city. It’s an exceptional island with a wide- range of flora and fauna. The island’s location is ideal for visitors on Uganda Safaris, less than an hour by boat from Kampala or Entebbe or an eight minute flight from Entebbe airport. The north-east part of this marvelous island is covered by small portion of rainforest and a larger forest is situated along the southern shore. The eastern shores of the island are less fertile and are covered with savannah-like grassland. The beautiful Island is composed of two hills, one with a thatched viewing point where sun downers on safaris to Uganda can enjoy the safari. 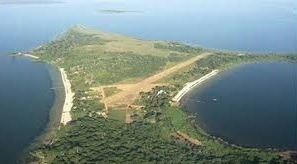 The kilometer long airstrip located in the Island can take planes up to caravans in size. There are 12 kilometers of white beaches along the coasts of the island with palm trees that produce delicious coconuts and hence the Island is a safe haven for adventurous tourist on Uganda safari tour. Organic farming thrives throughout the island with citrus, fruit orchards, sweet bananas and flourishing vegetable gardens. One of the great pleasures of the island which can be enjoyed by visitors on safari tour to Uganda is the sheer range and diversity of walks, runs and bicycle rides along the numerous well-maintained paths and tracks. The views from the two dominating hills are magnificent. In addition, the Island is also the best site where Bird watchers on safaris to Uganda can enjoy the views of 400 different species which are housed in the Island. Bulago is home to myriad of butterflies, monitor lizards, spotted necked otters, hippos and even the odd porcupine. Bulago has an Aerodrome licensed by Uganda Civil Aviation Authority; the aerodrome is 20 meters x 900 meters, day VFR only. It was designed so that it could be licensed as a day/night VFR runway and could be lengthened to 1,000 meters easily and out to 1,500 meters if the runway was extended into the lake. In nut shell, it’s hard to believe that such a strikingly beautiful gem of an island is not located in the Pacific Ocean, but right here in Lake Victoria and hence the best way to explore the island is under taking safaris to Uganda.